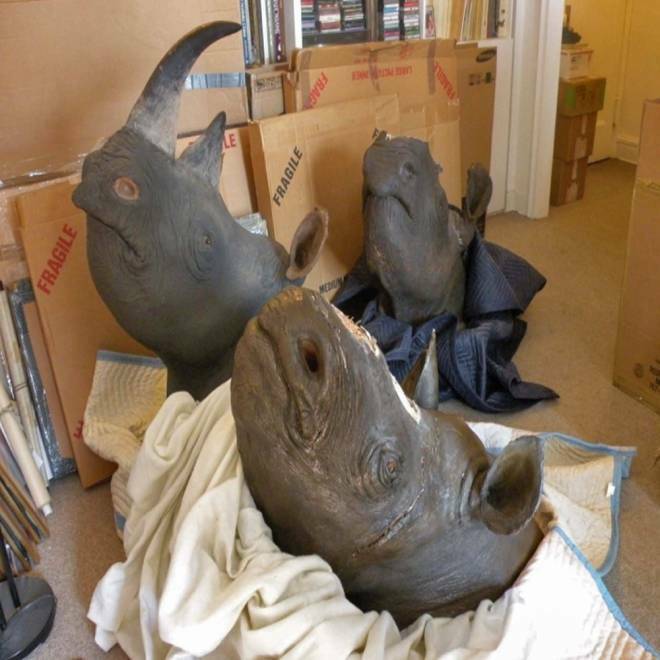 These mounted rhino heads were among the items seized at the apartment of David Hausman, a New York City antiques dealer. In the underground world of trafficking in endangered animals, undercover agents are accustomed to shady characters and even gun-toting thugs. But an antiques dealer who pretends to be helping protect wildlife when in fact he's double crossing you? That's what happened when the U.S. Fish and Wildlife Service went after the illegal trade of rhino horns, which are sought after in Asia for ornaments and even for purported medicinal qualities. A horn can go for up to $250,000, a recent NBC Rock Center investigation showed, making a gram more valuable than gold or cocaine. David Hausman, a New York City antiques dealer, on Tuesday pleaded guilty to breaking laws protecting endangered wildlife by obtaining horns to make "libation cups" and passing them off as antiques that can sell for up to $300,000. He "pretended he was helping law enforcement protect a species from being wiped out but instead he was contributing to the very problem," Manhattan U.S. Attorney Preet Bharara said in a statement announcing the guilty plea. Of five species of rhino, three are critically endangered. Hausman told a federal court judge that he had "failed society, my family, my friends ... and the conservation and animal rights community." The temptation was great. "Antiques Roadshow" on PBS had an appraisal last year of five Chinese-carved rhino horn cups from the 1600s and 1700s that were valued at up to $1.5 million, Edward Grace, deputy chief of law enforcement at the U.S. Fish and Wildlife Service, told NBC News. "This helps to illustrate the astronomical prices that (antique) rhino horn cups are selling for ... anywhere between $80,000 to $300,000 and sometimes higher," he said. "Because of the high prices individuals are paying for the cups, individuals are now trying to pass off newly carved cups as antiques, which is contributing to the increase in demand for rhino horn." The tale started in December 2010 when Hausman was helping officials go after illegal trading. He provided a tip that an auction house had illegally sold the taxidermied head of a black rhino but before officials could intervene he "covertly purchased the rhinoceros mount himself, using a straw buyer," the U.S. Attorney's Office stated. Just days after Rock Center aired Harry Smith's report, "The Last Stand," on the growing epidemic of illegal rhino poaching in South Africa, three of the rhinos featured in the report were attacked by poachers. Rock Center's Harry Smith reports. Hausman, 67, then "directed the straw buyer to remove the horns and mail them to him," it added. "He then made a realistic set of fake horns ... in order to deceive law enforcement in the event that they conducted an investigation." During this time, Hausman also responded to an online seller of another taxidermied black rhino head and horns. The seller turned out to be an undercover agent. Hausman bought the mount at a truck stop in Princeton, Ill., the attorney's office noted, after which "agents followed Hausman and observed him sawing off the horns in a motel parking lot." Hausman was finally arrested last February as part of an ongoing nationwide investigation dubbed "Operation Crash" — crash being the term for a rhino herd. Six others were arrested around the same time in New Jersey, Southern California and Texas. Agents seized four rhino heads and six black rhino horns at his apartment, as well as numerous carved horns, fake horns and $28,000 in cash, the attorney's office said. Hausman could have faced 25 years in prison, but a plea deal is expected to mean two years at sentencing on Dec. 5.